I have the good fortune to live between two race tracks. One’s the real thing with bleachers, paid admission and corporate sponsors jockeying to rename the place, seemingly on a weekly basis. The other doesn’t have the high-profile or the big-money backers. It’s not even a real track. It’s a two-lane blacktop. But Skaggs Springs-Stewart’s Point Road, or just Skaggs, as the locals call it, is the place many prefer. The winding ribbon of asphalt stretching about 35 miles from Lake Sonoma to Highway 1 is the perfect spot to drag a knee or pin the throttle on a long straight. Its sweeping turns, elevation changes and noticeable lack of cars have helped it achieve a cult following. Much of Skaggs is a lonesome back road that narrows as you get near the coast. It’s slow-going and rough in places. You get the feeling the county road crew hasn’t been out there in a while. But the first 10 miles is wonderful, track-quality stuff. People come from all over the Bay Area and beyond to ride it. YouTube videos are plentiful and the road is mentioned on riders’ forums everywhere. Comparisons to professional tracks abound. Always wanted to ride Laguna Seca? Here you go. 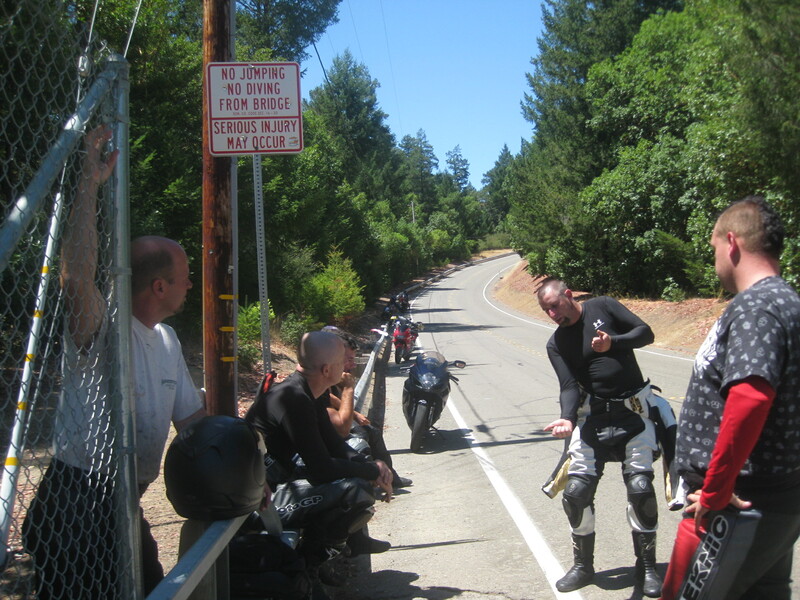 On weekends, sport-riders in full leathers gather at the bridge at the 10-mile point. They swap stories about crashes or close-calls with cops while puffing cigarettes and swigging sports drinks. 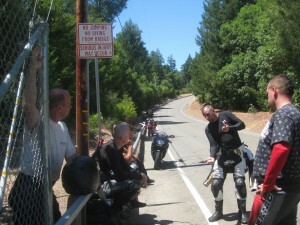 Their bikes cool in the shade next to a guard rail plastered with motorcycle stickers. Many ride back and forth in a continuous loop, the roar from their engines echoing through the hills. Others are just passing through on their way to other adventures. It’s beautiful country. When you’re not going 80 you might even see a bit of it. On the other hand, taking your eyes of the road for even a second can be foolish. Everyone in this crowd seems to know someone who’s been maimed — or worse. Still, no one is wishing they were some place else, like Infineon or Sears Point or whatever it’s called. Who needs a real track when you have all this?